Commonly used nanocarbon composite materials are routinely synthesized from petroleum-based resources. To avoid their bad impact on the environment, using cellulose-based materials as the promising resources is a better choice due to its easy acquisition and rich reserves. 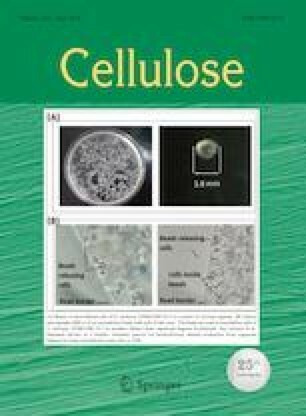 In this study, microcrystalline cellulose was selected as the carbon precursor to synthesize novel cellulose-derived 3D-graphene/LiOH·H2O nanomaterials for chemical heat storage to improve the efficiency of thermal energy utilization. The characterization and performance test results show that LiOH·H2O particles (5–20 nm) were highly dispersed on the 3D graphene carbon skeleton. These materials had excellent heat storage densities and thermal conductivities due to a completely new, hydrophilic, nano-reactive interface on 3D graphene. Among the materials, 3D-GF-VC-LiOH·H2O (Ascorbic acid-modified 3D-graphene/LiOH·H2O) exhibited the best heat storage and thermal conductivity properties. It achieved a thermal conductivity of 2.6 W/m K, which was 1.5 times that obtained with pure LiOH·H2O, and its heat storage density (2157 kJ/kg) was 3.3 times that of pure LiOH·H2O (661 kJ/kg). The activation energy could decrease to 27.5 kJ/mol. Moreover, the heat storage temperature range of LiOH·H2O was clearly expanded by introduction of 3D graphene. Hence, the addition of cellulose-derived 3D graphene is a very efficient means by which the design of chemical heat storage materials can be improved. Financial supports from the National Science Foundation of China (No. 51406209) and Research Foundation of Education Bureau of Hubei Province, China (B2017067).